I promised my son-in-law, Jeremy, a painting for Xmas - or rather I gave him an IOU for a painting which didn't exist at the time. 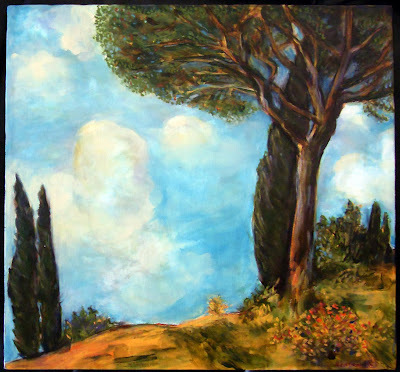 It's for the dining room in their house in Houston and was inspired by a John Singer Sargent italian watercolor . 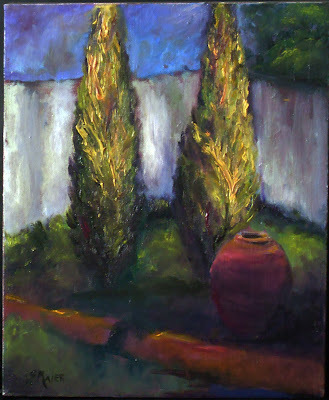 I am also sending a smaller oil I bought several years ago - by Shirley Meir - it reminded me then of my mother's garden and now, I like how it looks together with my own Italian cypress.